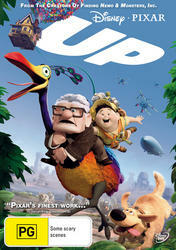 A grumpy 78-year-old man, an eager boy scout, a talkative dog, an elusive giant bird and ten thousand helium-filled balloons attached to a house are the ingredients for the most fantastic journey of a lifetime in Pixar's tenth, and arguably greatest, animated comedy adventure UP, available on Disney DVD and 3-Disc Disney Blu-rayTM Combo Pack, 13 January 2010. The Combo Pack includes a Feature and Bonus Blu-ray Disc plus a DVD copy of the film in a single package. In a beautiful tale about living out your dreams, Carl Fredricksen (voiced by ED ASNER) is a lonely and miserable old man desperately holding onto his house and the memories contained within it. With new building construction going on all around him and developers anxious to get their hands on his property, Carl makes one final mistake and falls prey to their plans to have him moved to a home for the elderly. But what they don't realise is the journey of Carl's life, his boyhood fantasies and his passion to fulfil his promise to his precious wife Ellie, to one day make it to Paradise Falls in South America. With Ellie's passing, there's nothing now worth staying for, so Carl takes the leap of his life and ties thousands of balloons to his house, successfully floating away just like his boyhood hero, adventurer Charles Muntz (voiced by CHRISTOPHER PLUMMER). But soon after his glorious take off, Carl discovers an unwelcome visitor; 8-year-old boy scout Russell (voiced by JORDON NAGAI) a young wilderness explorer eager to earn his final scout badge by assisting the elderly, is holding on tight to the porch. Too late to turn back, Carl and Russell manage to land after surviving a terrible storm, miraculously with their actual destination in sight. Like a man refusing to lose the weight of his failures, the unlikely companions embark on a journey across the mountains to Paradise Falls dragging the house behind them. But trouble is never far away as they come into contact with a giant chocolate-addicted bird, aptly named Kevin the Snipe. What they don't realise yet though is that finding Kevin is the same quest of Carl's hero Charles Muntz who took off for Paradise Falls many years ago and never returned. With Muntz now hot on their trail, but still determined to fulfil his hopes of reaching Paradise Falls, Carl is faced with the possibility of having to let his dream go to rescue Kevin and her chicks from Muntz and his evil army of speaking dogs. Befriended by a lovable and hilarious golden retriever named Dug, and with Russell loyally by his side, Carl must decide whether to let go of the past so he can rediscover what it is to again sacrifice to make life truly worthwhile. Only on Disney DVD and Blu-ray can you view the amazing special features including the hilarious and heart-warming 'Partly Cloudy' theatrical short, exclusive 'Dug's Special Mission' short, alternate scene, director commentary and an 'Adventure is Out There' feature documentary. The Blu-ray release additional bonus feature disc within the Combo Pack is not released to DVD and includes bonus material an Easter egg, global guardian badge game powered by BD Live&trade;, documentary features, promotional montage, trailers and a 'Married Life' alternate scene. An inspiring adventure filled with lots of heart and humour that everyone will enjoy UP is a truly amazing DVD experience. Don't miss your chance to own one of the most successful and creative films ever made, when UP is released to Disney DVD and 3-Disc Disney Blu-rayTM Combo Pack, 13 January 2010.